A delightful and modern 3 bedroom villa in a prime location with all amenities on hand. It consists of 3 spacious bedrooms, 3 bathrooms and will accommodate up to 6 people. The master bedroom has large fitted wardrobes and en-suite bathroom with a full bath/shower, hand basin and toilet. The 2 twin bedrooms have fitted wardrobes and all have en-suite bathrooms with shower, hand basin and toilet. This modern, tastefully designed villa is light and spacious and would be ideal for families and friends looking for a relaxing and quality holiday. The lounge area is comfortable and inviting with Flat screen SKY TV, (sports and movies)free WiFi and CD player. The villa has full A/C in all rooms and a fully equipped new modern American style kitchen with a utility and drying area. On the terrace you will find a relaxing hot tub then enjoy the private south facing sun terraces furnished with comfortable sunbeds and later dine on the upper terrace and enjoy that alfresco dining experience. Lanzarote (Island of dreams): Lanzarote the sun-kissed easterly island of the Canaries is claimed to be the most exclusive. The climate is dominated by north eastern trade winds and the warm Canarian stream producing glorious summer temperatures all year round. The main resort is in the centre of the island and the most popular resort being Puerto Del Carmen with over 5kms of golden sand, rocky divides and palm trees. Only a few minutes stroll away from the hustle and bustle of Puerto Del Carmen's beach and promenade, Villa Rosso can be found. All the Luxury bathrooms are fully tiled. There is a large flat screen TV in the lounge with a full SKY package to include movies and sports. Free WiFi throughout the villa. Sit back in the sumptuous leather lounge suite and enjoy the odd evening in. 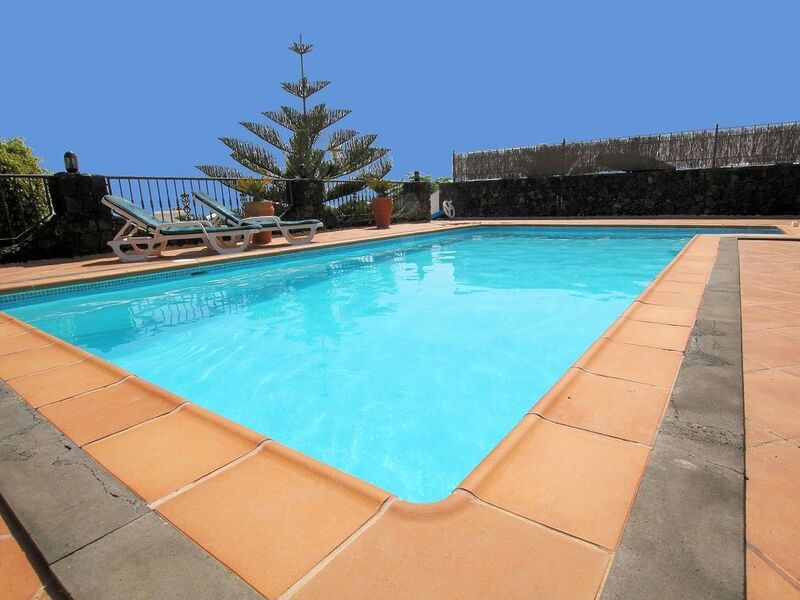 Recently refurnished and updated to retain its luxury status amongst the better villas in Lanzarote. A large hot tub spa jacuzzi is on the the terrace by the pool is for that soothing and relaxing soak and hydro-massage. Also after spending a day in the sun relax with a game of American pool on your very own pool table. This was our 2nd visit to this villa as we loved it so much. With an excellent location to the old town and the main strip it is ideal for all. The villa's facilities kept all the family happy with a good size swimming pool, lovely hot tub, good hot showers and all the channels you could wish for on the TV, sports, kids, films etc. The pool is well maintained to a high standard, the pool cleaning staff and housekeeping staff were lovely and friendly too. As well as all this the customer service from Roy and Jill is wonderful, their professional, efficient and kind manner goes a long way to making your holiday a relaxing experience just knowing that you are in safe hands. We had a wonderful time and look forward to booking again. Me, my partner and 3 children recently stayed in villa rosso, and had a fantastic holiday. The villa is in a great location , about 10 minutes walk to either the beach or old town. Inside the villa is great and very modern, the brand new bathrooms are amazing! But for me the best part was the outside area, the pool was fantastic and a really good size. There was also a large BBQ with a shaded terrace area for when the sun was too much. Would not hesitate to book again. Thanks for a great review. Look forward to welcoming back in the future to one of our villas. This was our second stay at Villa Rosso and yet again, it did not fail to deliver - the new bathrooms are stunning!! Jill welcomed us on the first day to explain the facilities and advise on the housekeeping rota. The villa was cleaned regularly as was the pool. 10 minute walk in one direction to the main promenade and 10 minute walk in the other direction to the Old Town. Plenty of shops and restaurants - with the added bonus of Lidl nearby! Check out the Open Air Cinema at the main shopping centre for an added treat! We look forward to booking again for next year! Thanks Jill & Roy! Glad you enjoyed this years holiday and look forward to welcoming your back in the future. We had a lovely relaxing week at villa rossa which is very clean and spacious . Very close to beach and local shops and restaurants. Our two boys loved the pool which had steps into and was a nice size. We loved the hot tub. A great location and we would highly recommend this villa. Thanks for a greta review. Spent a wonderful week here recently. Location is good really easy to get around and a short walk to the beach. Villa was exactly as described and spotlessly clean. 3 good sized bedrooms with lots of wardrobe space and 2 full bathrooms. Really good information pack in the Villa and the welcome pack was an unexpected bonus, thank you. The outside space was truly wonderful with a huge dining table and chairs plenty of sun loungers and the pool and hot tub were amazing. All in all had a great time see you next year. Thanks for a great reveiw. Villas Rosso is for me the perfect place to stay in Lanzarote. It is about 10 mins from the beach. The spacious villa is always spotlessly clean. The heated pool always maintained. Having all the UK tv channels is a lovely bonus. The owners are the most courteous hosts. I have stayed at many villas that offer a lot but the reality is something very different. I've rented Villa Rosso For the last five years next will be the sixth. I would highly recommend V Rosso not just for is fabulous facilities but it's easy access to the shopping centre, local supermarket and beach. A country mile ahead of most. Thank you for your positive review and we look forward to welcoming you back to Villa Rosso in the future. Villa Rosso is in an excellant in Puerto del Carmen and is just a short walk to the beach prominade and the picturesque Old Town with its sandy coves, seafood restaurants, tapas bars and international restaurants plus supermarkets and taxi ranks. Then take a leisurely stroll to the main promenade of Puerto del Carmen with its 5km of spectacular golden beaches, palm trees and rocky divides plus an abundance of boutiques, shops, tapas bars, national and international restaurants. Alternatively visit our fabulous marina at Puerto Calero and gaze into the clear waters to see the many species of fish, book a submarine or catamaran trip and then dine at one of the many quayside restaurants. The villa is centrally located on the Island and is ideally placed for the many excursions such as: Rancho Texas (theme park) Timanfaya National Park (live volcano), Camel rides, Jameos del Agua (caves) Cueves Verdes (green caves). Golf: Villa Rosso is conveniently located with a 3 minute drive to the brand new 18 hole golf course on the outskirts of Puerto del Carmen and the other more established course is situated in Costa Teguise which is also a 20 minuted car journey away.